Checking the movies on TV last Saturday I was really glad to see “The name of the Rose” would be aired that night – I’d forgotten how much I love that film. The dessert is delicious and all you’ll need is a bowl and a wooden spoon. The spice flavor is strong, so cut it back a little if you’re not a big fan. Preheat oven to 220°C/428°F and place a baking sheet on the shelf. Start by making the sponge: place the flour, brown sugar, baking powder, ground ginger, mixed spice, milk, oil and egg in a large bowl and mix well with a wooden spoon. Pour into a greased, round baking dish (23cm diameter x 6cm deep). Set aside. Now, the topping: in a small bowl, mix together the brown sugar, ground ginger and mixed spice sprinkle over the batter in its baking dish. Dot the butter on top and pour the boiling water over the mixture – don’t worry, it will work out in the end. Put the dish on the baking sheet in the oven for 30 minutes. Let stand for 10 minutes before serving, and make sure you scoop out the sauce beneath the sponge in the dish. Serve with the whipped cream. well that looks beyond delicious. i am so making that this week!! Hands off my spoon that cake is mine I tell you! Yummy, Patricia. Especially the topping! What's Santa going to do with that spoon? How dare he? This looks totally amazing - yummo! What an intriguing looking recipe. I love spice cake and the texture of this looks really delicious. Yumyyyyyyyyy cake. I am dying to have it. Perfect for Christmas. Pudding cake!!!! My fave is the gooey part. What exactly is "mixed spice"? Is that like allspice? Or pumpkin pie spice mix? Pumpkin Pie Spice is the closest thing to Mixed Spice that you can buy in the US. It's a blend of cinnamon, ginger, cloves, nutmeg etc. that's for sale in the UK under the name "mixed spice". Love the santa!! Although he doesn't look to willing to share!! Thank you Patricia! 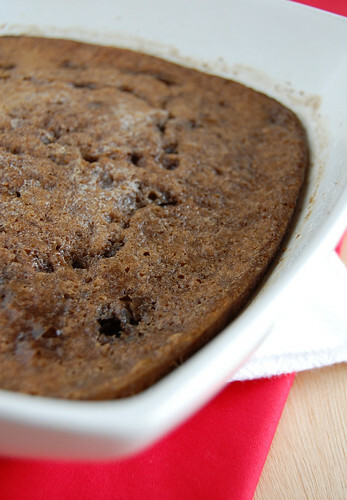 My boyfriend and I love spice cakes, I tried this yesterday and it is sooo good! I will definitly make it again. Next time maybe add some diced apples and risins. Perefct cake for winter and Christmas :) Love it! Arugulove, the spices here are very pungent. 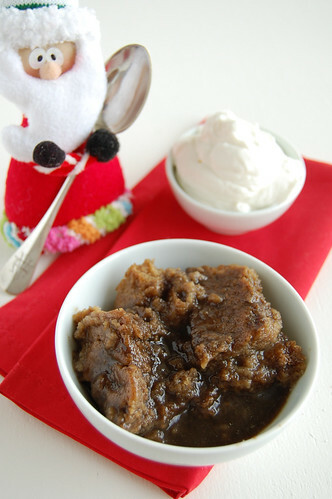 Hey, dearie, it's sort of a pudding, indeed - I think you'd like it! Anshika, thank you for stopping by! Joy, Anonymous has answered you - I'll update the post with a link. Anonymous, tks for the info! May, I'm so glad to know you've tried and liked it - thank you for telling me, sweetie! Mm mm! I love chocolate with spices, so thanks for sharing this Patricia. Btw, that Santa in the background is too cute!